Arriving home in America depleted from the carnage of World War II, young men of all ranks would have to make a decision on how best to erase the despair witnessed overseas. For some, this would mean immediate marriage and a reticent life in the suburbs. For Slim Aarons, a postwar pursuit of normalcy would involve the sun-drenched Italian coastline, secluded Swiss mountain resorts, and the private homes of the celebrity jet-set. A former army photographer, George Aarons (referred to as Slim for his 6’4’’ lanky stature) found relief from devastation through immersing himself in the picturesque lives of the upper class. His portraits of the wealthy defined a golden era for a new kind of celebrity, and he travelled the world recording the glamorous activity of high society and European aristocrats. His mission, he famously stated, was to photograph attractive people who were doing attractive things in attractive places. And this he certainly achieved. Subjects of his most notable work include Oscar de la Renta and Emilio Pucci eating lunch at Acapulco, Katharine Hepburn driving along the waterfront at Montego Bay, and Princess Caroline of Monaco lounging with her little dog Tiffany. He captured Humphrey Bogart at his home on Christmas Eve, John Kennedy on the campaign trail, and surrealist painter Salvador Dali at a ball in New York. These among countless models, socialites, and stars in the exotic settings of Costa Smeralda, Chateau St. Jean, and the island of Capri. Due to his positive portrayals of the rich and famous, the farm boy photographer from New Hampshire gained an unspoken trust with his subjects, earning him regular invitations to high society gatherings. 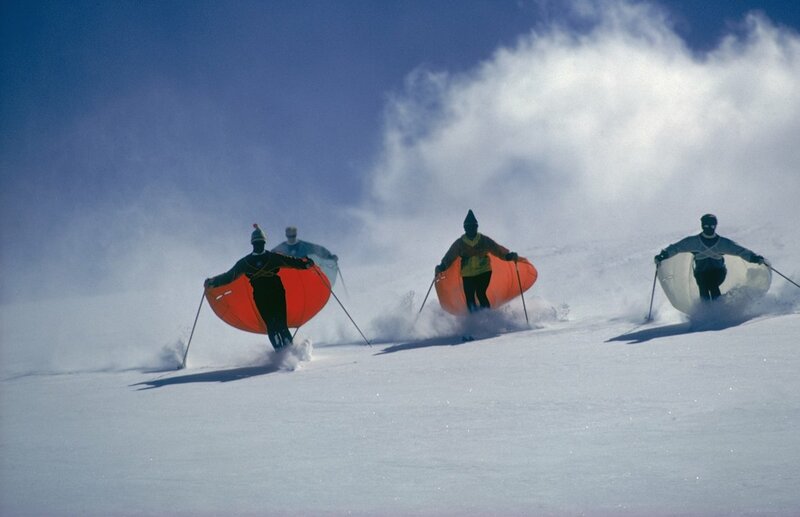 It was through galavanting with the leisure class and spending the seasons in style which led him to witness firsthand how the sophistication of the high street met the sport of the hilltops during the ‘60s budding ski craze. 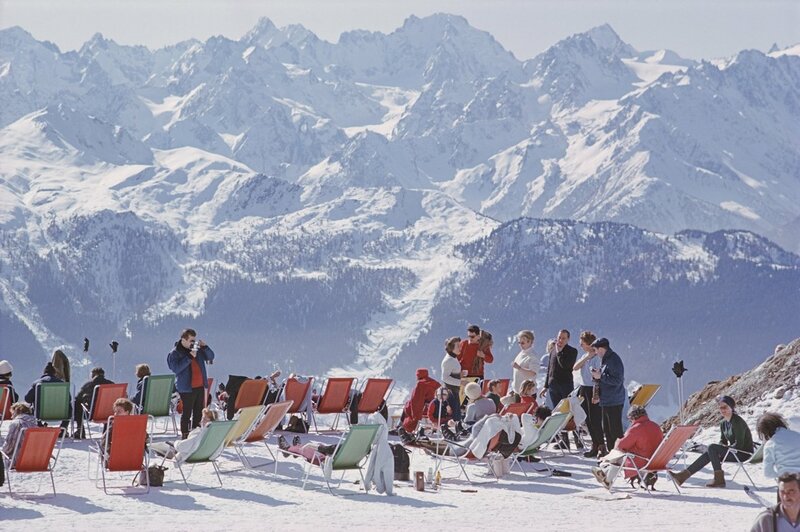 Resort construction exploded in all corners of the globe in the early decade, including La Plagne in France, Vail in the USA, Niseko in Japan, and Fernie in Canada. 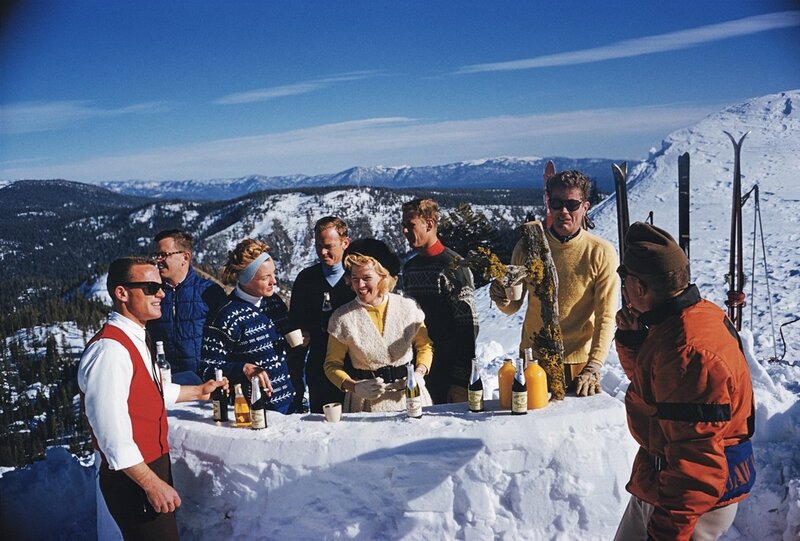 It was a time when glamour was injected into athletic pursuits, and the après activity of indulging in a glass of vin chaud in front of a fire developed into a sport all its own. These years preceded the tenth Winter Olympics in Grenoble, France where the traditionally separate scenes of fashion and sport intersected, and spectators on the sideline were deemed just as worthy a display as the intended entertainers. 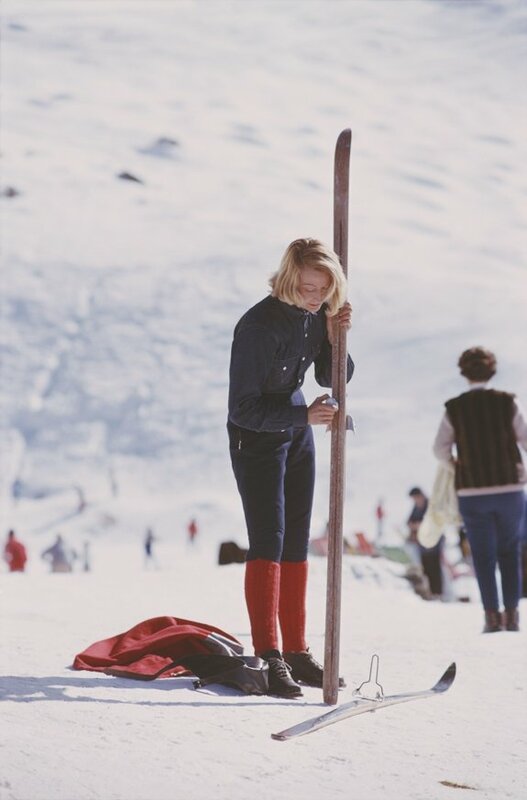 It was the event which introduced the handsome alpine skier, Jean-Claude Killy, and figure skating darling, Peggy Fleming, who earned equal attention for their post-slope style as they did for their four combined gold medals. Forgoing the gritty, black and white documentary style favored by military magazines for vibrant Kodacolor which complemented the sumptuous lives of his subjects, Slim Aarons put old money on the map. Through his imagery we can enter a world of unprecedented power over the course of three decades, and glimpse into lifestyles of luxury that are all but lost.